It's time to upgrade - keep all the features you love (maneuverability, dime-sized turning radius and ability to squeeze into those tight parking spots) and get a better, smoother, more comfortable ride. Do it all on one device, from the palm of your hand. These cars come equipped with the latest car2go technology that delivers an instant and seamless experience at every step - from locating a vehicle to starting or ending a trip - entirely in the app. 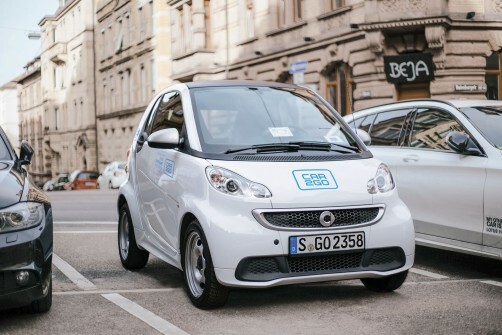 car2go has added 20 smart fortwo electric vehicles to the local fleet. This is the first step in evaluating the feasibility of using electric vehicles in our fleet by relying on Montréal’s existing charging infrastructure, as well as determining how the city’s climate conditions impact vehicle range and availability. What’s new about the next-gen car2go? These vehicles are best for short one way trips within the Home Area. For medium to longer term trips, please select any of our hundreds of non-electric car2go vehicles. When you find an electric car2go on the street, you’ll also notice the coloring on the car is a bit different – our electric smarts are all white in color as opposed to white and blue trim . The key is located inside the glovebox. Once you’ve turned the key, you’ll see the screen on the dash light up. The symbol “READY” will appear indicating you can start driving. Note that electric vehicles do not make a sound when starting. There’s no need to recharge the vehicle, our team will do that for you. For peace of mind, every available car will have enough charge to make a one-way trip anywhere within the Home Area. Keep an eye on the charge level of the vehicle while driving, when it gets to 20% consider ending your trip. How far can I get on a charge? The vehicle’s state of charge (charge level) will be displayed on the app just like fuel level for combustion engines. To help you determine if a car will meet your needs, use the charge chart below. Although the state of charge will always be enough for a one-way trip within the Home Area, using seat warmers, air conditioning, and driving at fast speeds will draw down the state of charge at a faster rate. *Chart is only a general reference and is not an exact indication of expected range given the many factors (environmental, topography, driving speeds, etc.) that affect battery drain. Then the vehicle will unlock. Voila! Heads up: For combustion next-gen cars, the key is located to the left of the steering wheel and the ignition is on the right side of the steering column. 1. Return the key to its holder, key chain tag first. 2. Grab your stuff, exit the car, and close the doors. 3. Then, you can end the trip on the app OR wait for the auto-end countdown to commence on the outside display. You’ll receive a pop-up alerting you that your rental was ended successfully. See ya later! 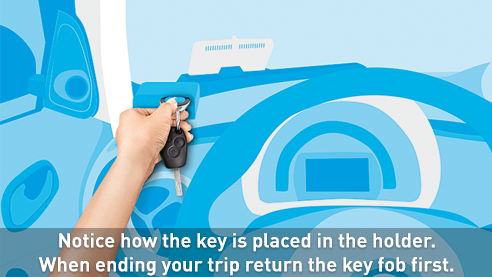 How to open the trunk, use the Bluetooth and set up navigation. Unlock the car (on the fob or inside), press the center button on the glass door in the back and lift up. Then pull the handle on the top of the bottom gate. Open sesame! Now you can sing along to that Sia song you’ve got on auto-repeat in your phone. All you have to do is select "Phone" > "Yes" > [Your Phone] > "Pair"
Direct yourself to the nearest coffee shop or cupcake shop in minutes with upgraded navigation. Click "select" and you'll be on your way. Now you've earned that cupcake. How to adjust the seats, headlights and mirrors. There are now two levers on the side of the seat – to adjust the backrest turn the handwheel on the top lever, and to adjust the seat’s height pull up or push down on the bottom lever. To move back or forth, simply lift the handle below the seat. Double check for the headlight icons on the next-gen cars when starting a new trip. Your dash may glow, but that doesn’t mean your lights are on. Make sure to twist the knob all the way counterclockwise before driving at night! 2. The knob can then be moved to the left or right as well as up or down. Doing so will move the mirror in the same direction.